Hi there, Tiana here. Born and raised in Hong Kong, I have lived in and travelled through some other places before ending up here in the Maldives. I hold a Bachelor’s degree in Biology (Marine Biology emphasis) and worked in a different field before finding my way back to the ocean. There was a lot to learn during my first weeks here. 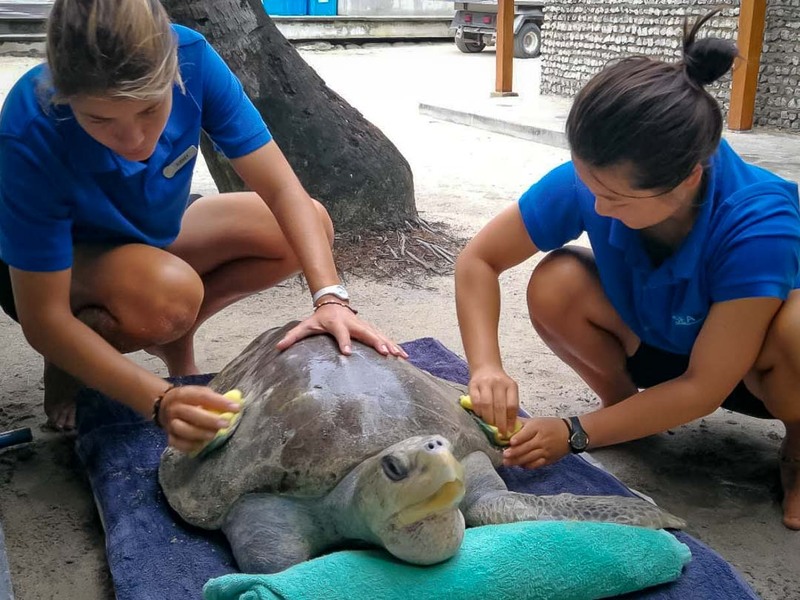 It is all hands on deck with turtle rehabilitation and care. Beybe’s condition requires the most attention and care but even with just the 6 other patients, it is quite a handful … or should I say ‘flipper-full’! With so many turtles, we did some rearranging to try to maximise the space for everyone. Vela, Juanita and Beybe are in a large pool together with no barriers, and we also took out the barrier between Marion and Pumpkin Pie. Speaking of Princess Pumpkin, she has begun to dive. When we took her out for a swim she was resting and grazing on the sea floor at a depth of 10 metres! I also spent my first two weeks shadowing and helping out with the excursions with Four Seasons guests. My head still spins a little trying to learn all the names of the local snorkel sites and island names! 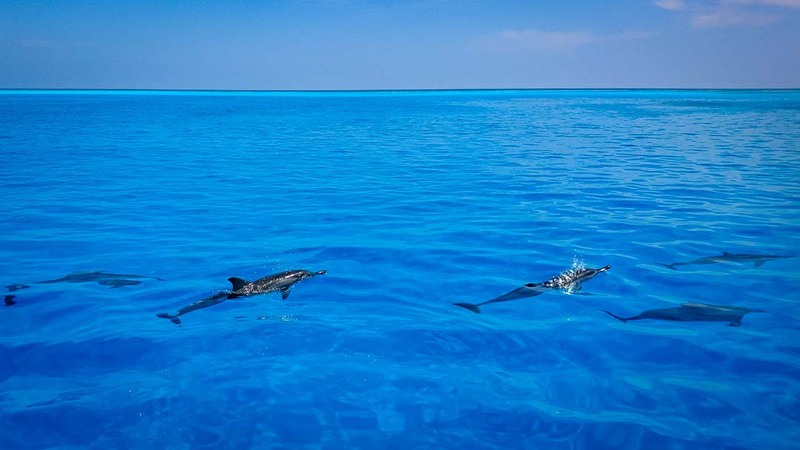 So far, there have been successful dolphin and turtle sightings for all the Dolphin Cruises and Turtle Safari trips that I have led. Fingers crossed that it stays that way! During the time I’m not busy with turtles or leading excursions, I’ve been helping Monty with coral frame propagation and monitoring. I conducted my thesis on coral speciation, but all my work with DNA fragments was confined to the lab, so it is exciting for me fill the gap and finally be working with corals in the water. April has been a very turtle-full month. 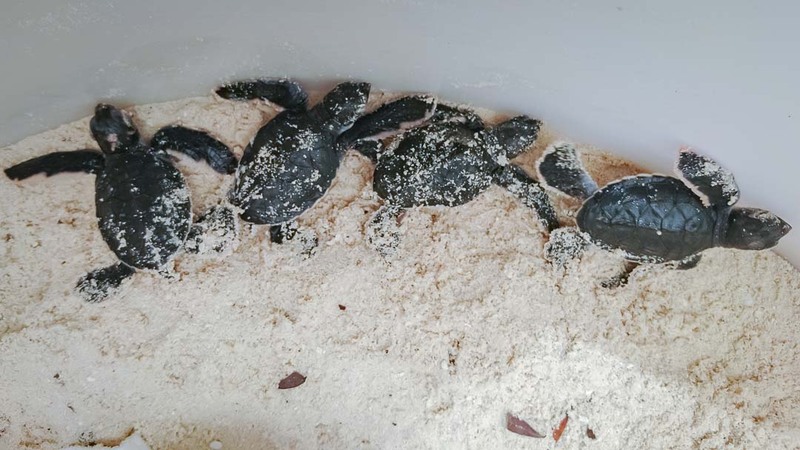 Things started off with some unexpected hatchlings found by resort guests. All but two of the baby hatchlings were released from the beach the same evening. The two that we kept were sent to our MDC in Kuda Huraa because one was injured and the other was too weak to make the big swim. Speaking of a big swim, two of our rehabilitation patients recovered enough to be released. Although Pumpkin Pie had two flippers amputated, she demonstrated excellent control of buoyancy during her ocean swims. The wounds on her stumps were fully healed and it was clear to all of us that she was active and healthy enough to be released back into the ocean. The other patient, who arguably made her own escape rather than being released, was Vela. She had previously shown no signs of diving in her pool or in the ocean. The plan was to take her out into the ocean more frequently to motivate her into starting to dive. 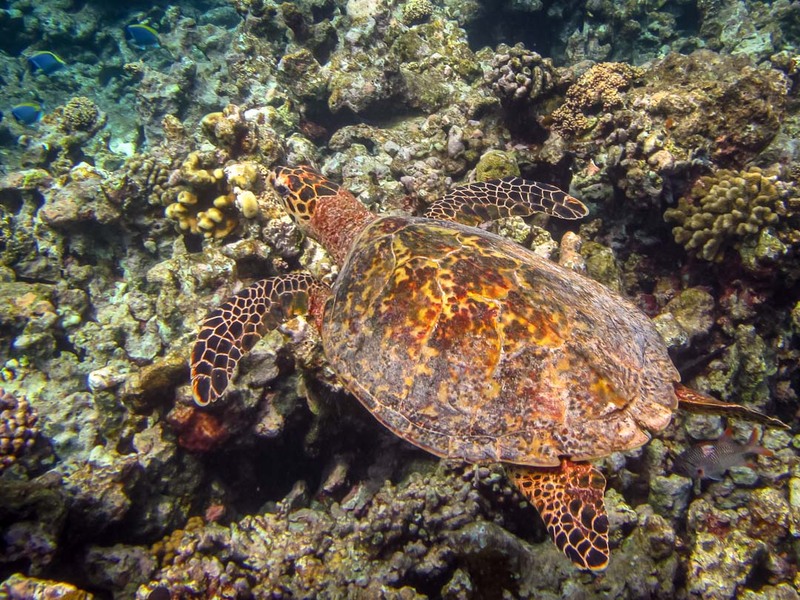 But she decided to prove that she didn’t need our help … and took one big breath and was soon swimming away out of our sight!